The 24th July is my onomastico (this means the day of the saint with my name). 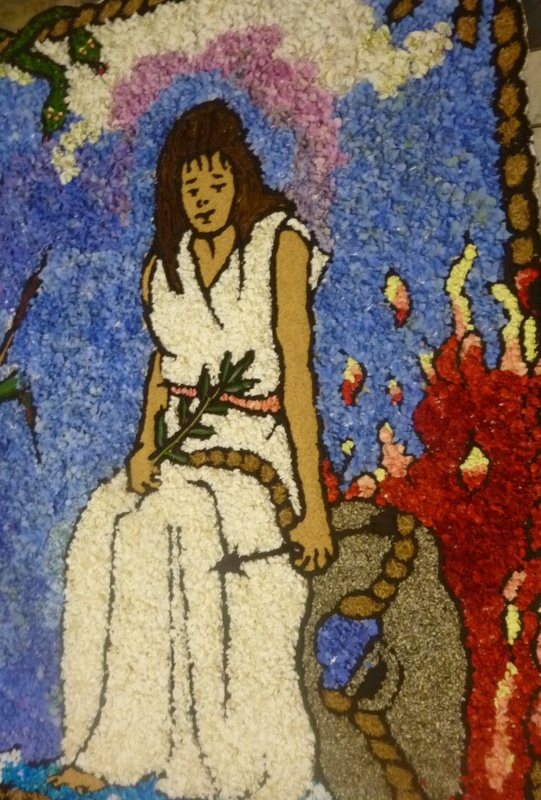 Santa Christina is celebrated in Bolsena a few miles from Viterbo on the lake of the same name. In the church next to her tomb this image of her was displayed. It is entirely made with flowers and seeds. At 10pm her effigy is carried from the church past living tableau depicting her martyrdom. There are 5 tableaus on the evening of the 23rd and 5 in the morning of the 24th. The idea is to follow the crowds and see each tableau as the curtains open. All are gruesome but the goriest is the one that shows her having her tongue cut out with the requisite blood on her pure white dress. When you reach the top of the town where the castle is situated there are devils in very scanty state of undress leaping around and fireworks and loud bangs with lots of smoke; the saint stays in the church by the castle until the following morning when she proceeds back down the hill to her church. Back to gardening for the next post. Sorry this is late, pressure of work and other commitments. I took all the images on the 14th. I am surprised by just how many plants are flowering this month. Usually in July the garden is entering its summer dormant stage. But this year it seems that just about everything is flowering. 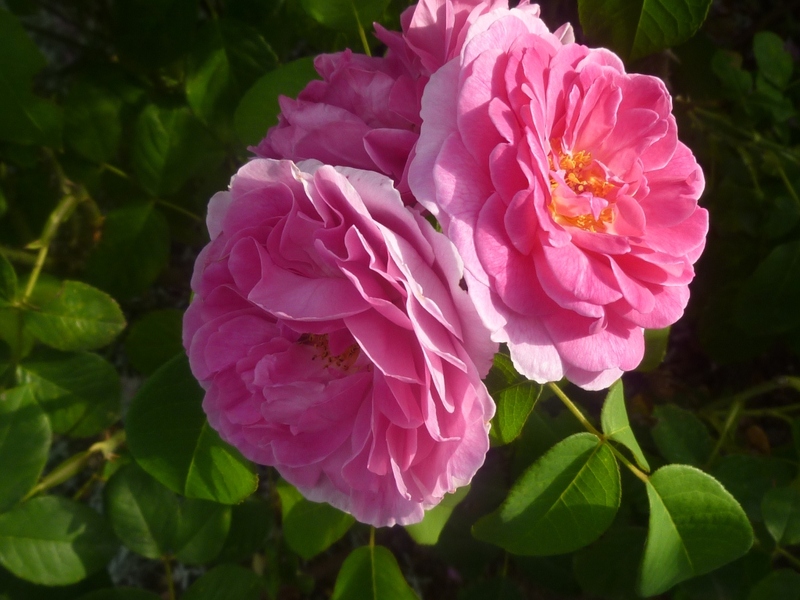 I am very happy that all the roses are flowering for a second burst. 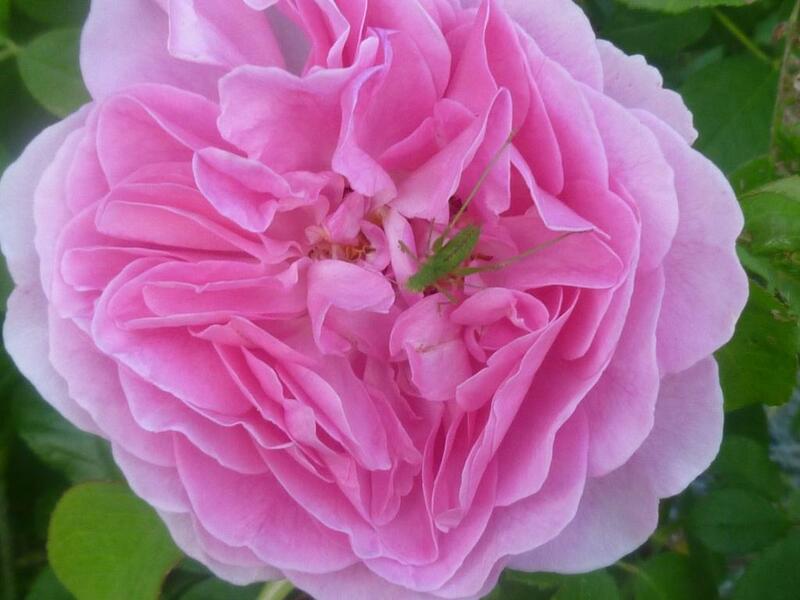 Some like Gertrude Jekyll only put on a second show during September and October last year, but this year they are nearly as full of blooms as they were in May. I have mentioned before that I am becoming more and more aware that it is the overall grouping of plants and the fullness of the borders that is pleasing me more than individual plants, however special they may be. This doesn’t mean that I don’t enjoy seeing other bloggers special plants and proudly produced ‘difficult’ flowers; just that for my own garden and when I am designing for clients it is the overall effect I am aiming at. I feel this is achieved by the correct choice of plants for a particular environment. If this means I can’t grow some plants I really love, so be it. A plant that is not happy where it is will never give of its best and will appear sad rather than giving the joy one hopes for. So I really enjoy seeing these plants vicariously on other bloggers posts of rarely in visits to other gardens. 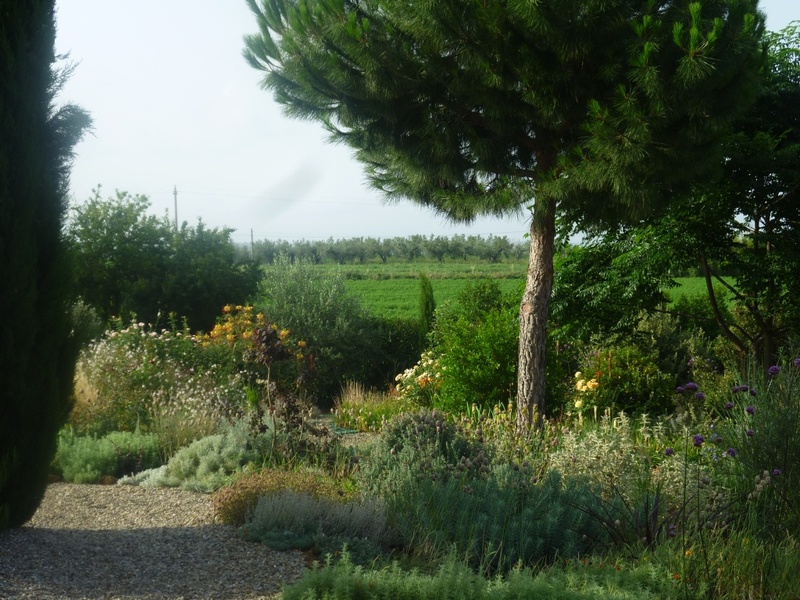 I think in the UK gardeners are not so aware of this because in reality the climate is more accommodating than in the extremes we experience in Italy and of course other countries too. In England the summers are never too hot for too long; and in winter never too cold for long periods and of course it does rain fairly regularly. In Lazio there is always a 3 or sometimes even 4 month period with no rain at all with hot winds and daytime temperatures that hover around the low 30° C and only falling at night into the mid 20°s C. I don’t believe in irrigating excessively and large areas of my garden are not irrigated at all. I will water if I see a plant suffering and naturally new plants, especially if they are large specimens will need irrigation until they are established, but my aim is to select plants that will thrive in these conditions. Where I do irrigate I do so by means of buried drip hose so that none of the water is lost to evaporation. I also water for a long period but infrequently only once a week or every 10 days, this encourages the roots to grow deep to search out water that is deep down in the soil. I also mulch and this definitely makes a big difference to the water retention of the soil. Click on the image below to see all the flowers blooming in My Hesperides Garden today. Thank you to Carol at Maydreams for hosting GBBD for us all. I will enjoy looking at many other posts to see what is flowering all over the world today. Happy GBBD to everyone. 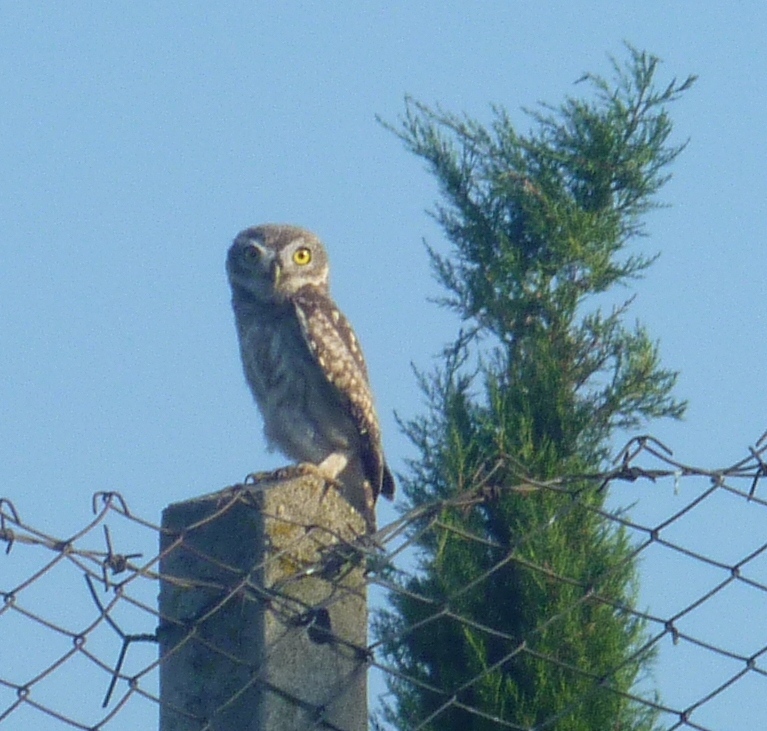 At last I managed to photograph the Little Owl, actually this is the chick, quite newly fledged. 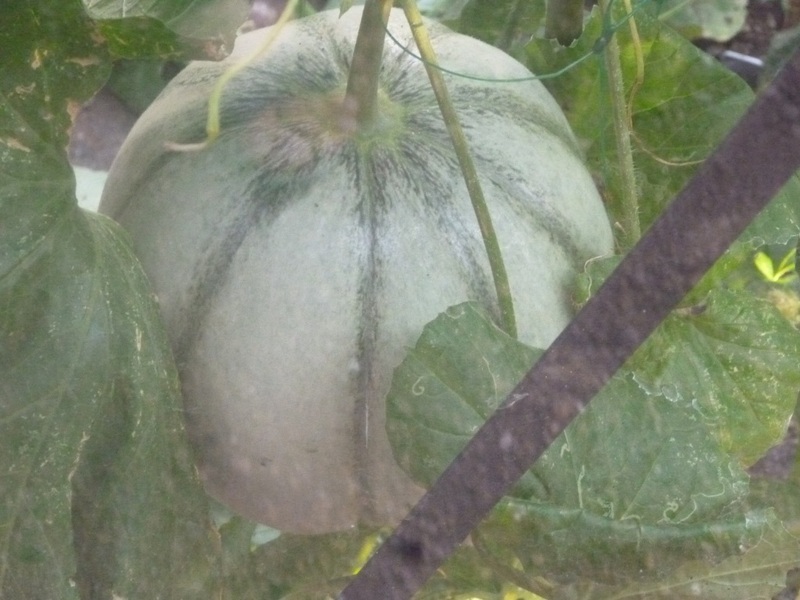 Yesterday when I opened the greenhouse door in the morning there was an overwhelming perfume of MELON! 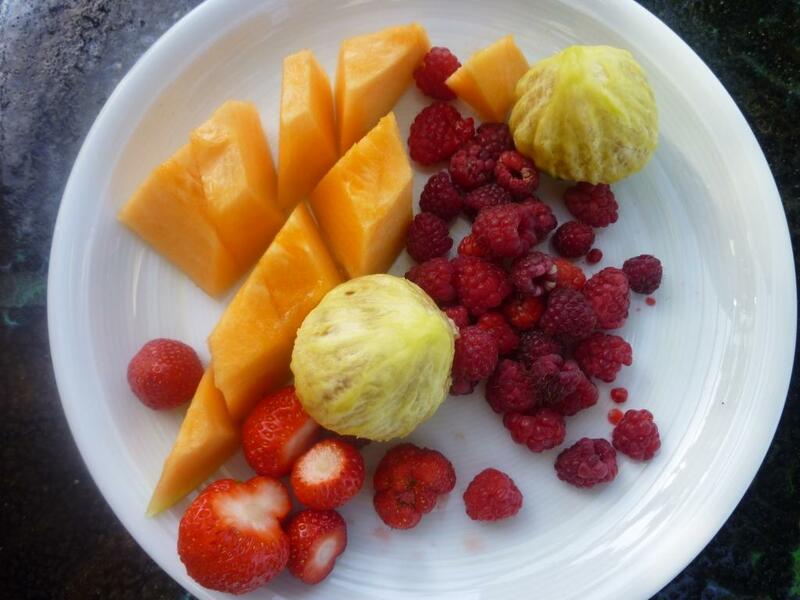 So this morning I ate just fruit for breakfast, all of it from the garden. There were many more raspberries and strawberries but I’d eaten them before I thought about writing this post! 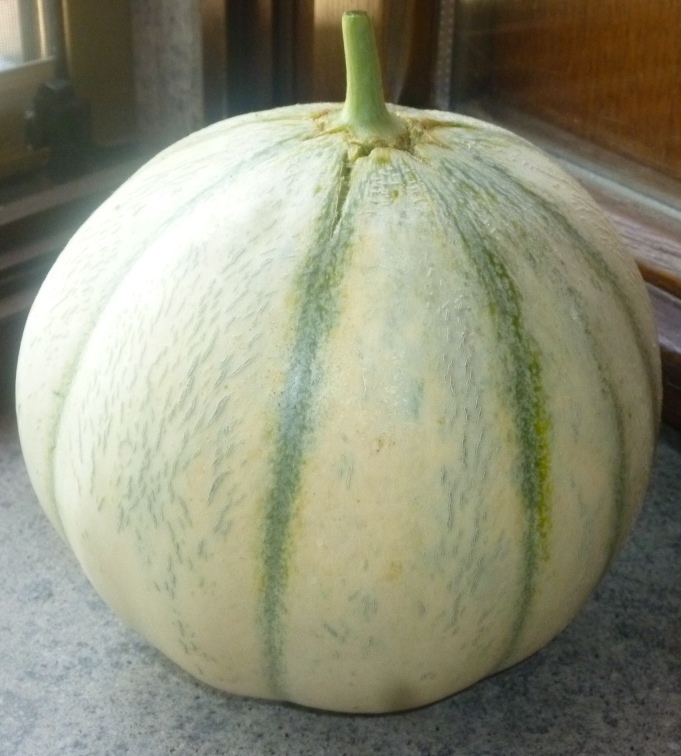 The melon weighed in at 1.75 kg, its weight was just beginning to make the stalk come away from the fruit. Here it is growing in the greenhouse and in all its glorious stages. 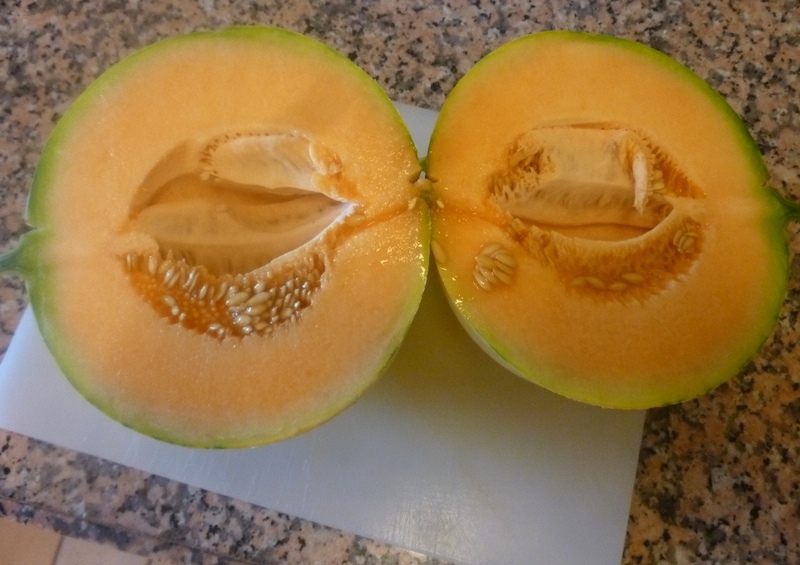 I still can’t quite believe that I can grow melons, which is the reason for the excessive number of images. Those of you who have this Ikea chopping board will understand the size of the melon. Figs are really my favourite fruit and this year there are more than ever before but the birds have also decided they rather like them so I don’t know how many they will leave for me. The strawberries are being very productive and the raspberries are still producing enough to eat some every couple of days; new stems have grown that will produce more fruit next month, I imagine. 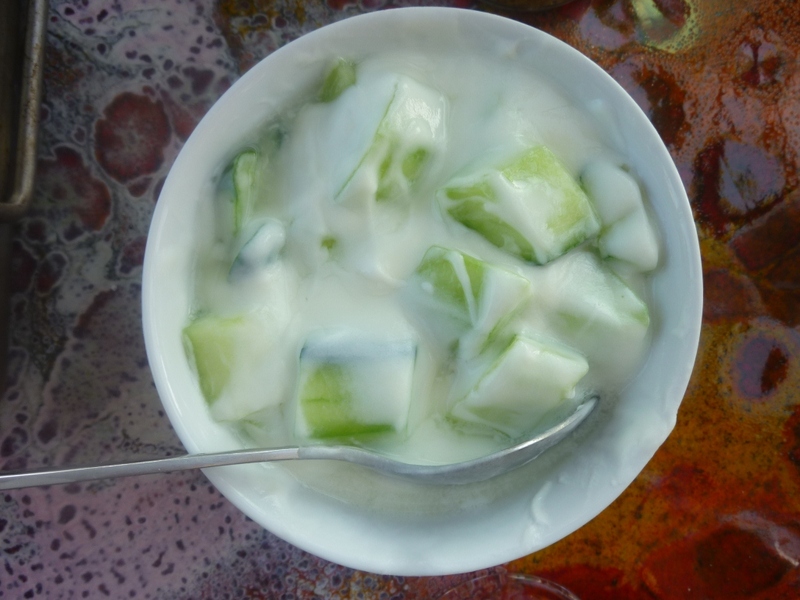 We are eating meals that consist many of vegetables as there is so much produce being harvested. 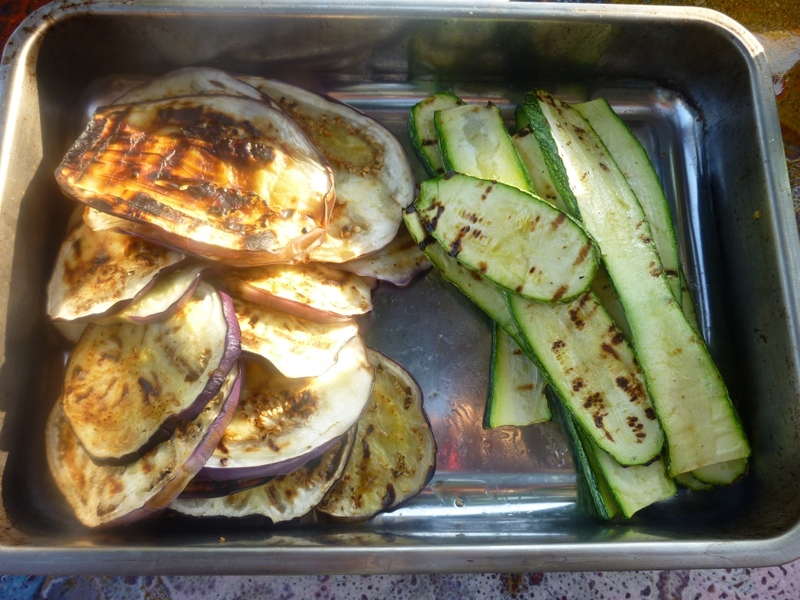 Yesterday evening we barbeque-grilled peppers, sliced aubergine and zucchini (courgettes) and I made a tomato salad with T. Mamande precoce (early) and a yellow pear-shaped tomato that I grew from seed that came from a tomato a friend gave me 18 months ago (I had been worried that they wouldn’t come true from the seed as she had many different varieties. 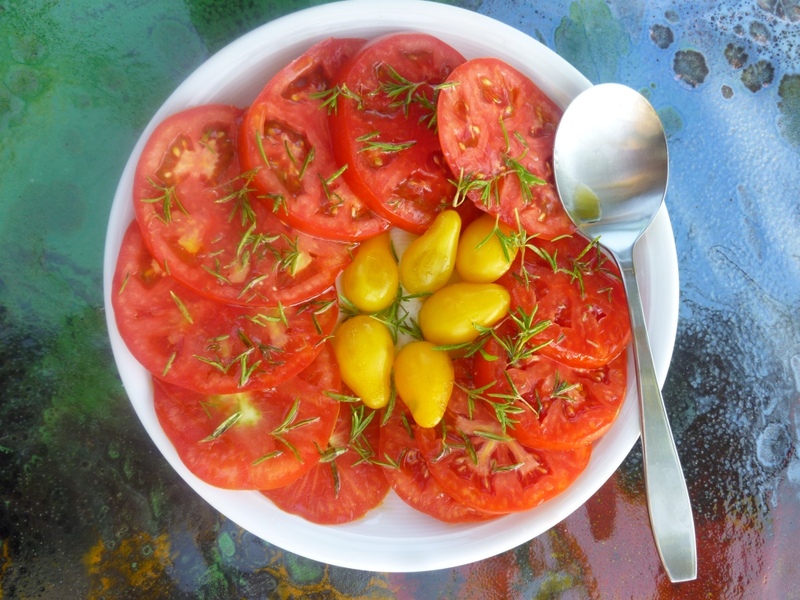 The green herb on the tomatoes is a thyme-like herb that tasted of pepper, sometimes I use basil as well. For a little appetizer I cooked a cob of sweetcorn. There is something so very satisfying about harvesting and eating immediately crops from the garden. I especially love picking strawberries and raspberries and eating them still warm from the sun.